Файловый менеджер для сайта - незаменимый инструмент вебмастера. Ниже представляю список файловых менеджеров на любой вкус и цвет. Минималистичный интерфейс, зато всего один файл. Из видимых недостатков не нашел разархивирования файлов. HTTP Commander - веб-файл-менеджер для серверов Microsoft (ASP.NET). Основные возможности: Интеграция с облачными хранилищами, электронных документов и изображений редактирования услуг. Мобильная интерфейс. WebDav поддержка. Проверка подлинности Windows. 50 + языки поддерживают. Интеграция с MS Office, Open Office и Office Web Apps. Предварительный просмотр и проигрывание мультимедийных файлов непосредственно на сайте. Документы и изображения могут быть изменены прямо в Интернете. Позволяет просматривать превью изображений, текстовых файлов, сжатых файлов или аудио. Он имеет поисковую систему, текстовый редактор с подсветкой синтаксиса, возможность использования тегов, воспроизведения MP3 и воспроизведения видео с нескольких - языковых плагинов. PAFM дает пользователю полный контроль над файлами.Редактирование исходного кода может быть сделано с помощью CodePress с подсветкой синтаксиса. Имеются версии QuiXplorer на английском, голландском, немецком, испанском, французском и русском языках. PHP navigator with its unique XP style navigation is written in PHP and AJAX. The main features include multiuser support, Gzip & Deflate webpage, built in HTML and code editor as well as Extract Zip. This web based file manager is completely free. Key Features: File or Folder can be downloaded as Zip, Zip archive can be extracted to current folder, Key board shortcuts. The iDC file manager is a multiuser file sharing system which can be installed either on Linux or Windows web server. Every format of digital media such as documents, images, audio, video, publishing layout, presentations and PDF files can be saved, shared and managed. The application is driven by MySQL Database. Key Feature: Hotlink Function with Social Network Support, Monitor User Activity with Built-In Log Viewer. It’s Available in 8 Languages. FileMan has a compatible file browser to easily access files and directories. WYSIWYG editor enables creation and editing of html files. ASCII/binary transfer capability enables uploading one or multiple files. Functions such as searching for files based on file names, replacing files and much more can be easily carried out. The powerful archive management system is a feature of FileMan which allows creating, viewing and extracting .Tar files. Key Feature: Improved HTML Editor , access to a multitude of options and formatting tools, ‘AJAXified' User Interface. The Relay is released under GPL. 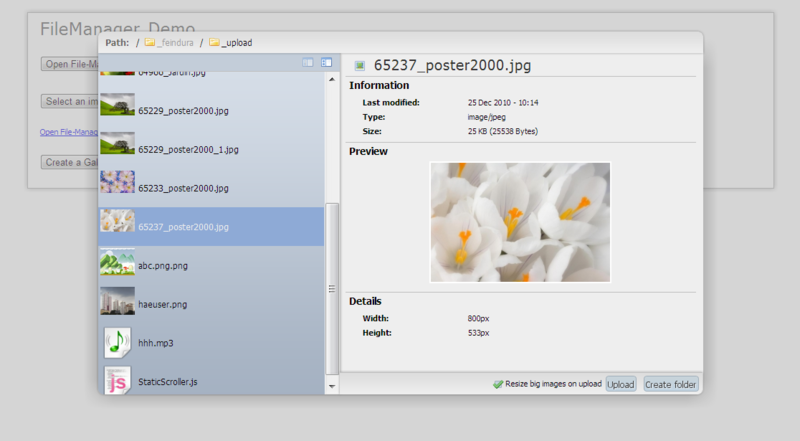 It is AJAX enabled, also features improved UI and performance, which is ideal for large file sets. Files and directories uploaded into file stores from other means can also be easily handled. Key Feature: Drag-and-drop files and folders, dynamic loading file structure. phpXplorer, as the name suggests is written in PHP. This is a free open source file management system. The file types, property sheets, views and themes are built on its own by modular design. The permission manager restricts the user access to multiple users in a detailed manner. Key Feature: It has got dialogs for editing HTML, PHP, image, Apache, compressed and email files. This is a web application which uses SharpKit to maintain client-side code in C#. It is a simple free and open-source file browser project, maintained at Google Code. Local and network drives can be easily browsed. Requirements: NET 4 Framework, IIS Express. Key Feature: Image view - with a preview of the first photo from each folder, sorting by any column(s), Next/previous sibling folder navigation. Getting your own data stored in an open source community had never been so easy and reliable using this file manager. By using this web based file manager you decide with whom to share which information and to what extent. The data can be accessed through web browsers, iOS, Android devices and your desktop and laptop. It supports MS Windows platform. It’s an advanced free to use open source cloud storage through which you can access and store your own data and share it with groups and teams as and when you desire. It can be operated with just about any advanced mobile device, internet browser, desktop or laptop. It is supported by all popular platforms. It is an advanced file management system and that converts information into a single file. Supported by Linux and Windows, you can access your data and share it with your team with just about any mobile or computer devices. You can copy, move, delete, remain and a host of other things with this advanced file manager. It is an open source PHP and MySQL application though which you can store and share your information from just about any server and advanced mobile and computer devices. Supported by Windows and other well known operating system, the encryption ensures that your confidential data is protected by a security code. It is a file browser written in PHP and it is free for anyone who wants to create and manage files in the cloud environment. The application is loaded with user friendly features through which you can manage all the related functions associated with file management. It can be accessed and operated on Android and other mobile applications, desktop and laptop. It is a PHP application which enables you to manage files in a cloud environment and share it with your team or community. Supported by Linux, Windows and smartphone applications, the software is easy to install and use. The encryption ensures that the confidentiality of the information is maintained. It is a state-of-the-art web file management system that manages your file as effectively as any operating system does. Runs on Windows XP and other well known operating systems. The encryption policy ensures that the data can only be accessed by different systems with permissions issued to different users. It is loaded with a recycle bin feature and fast interaction is possible via AJAX. It is a well equipped free file browser system and works with Apache 2 web server; it's also compatible with other well known servers. 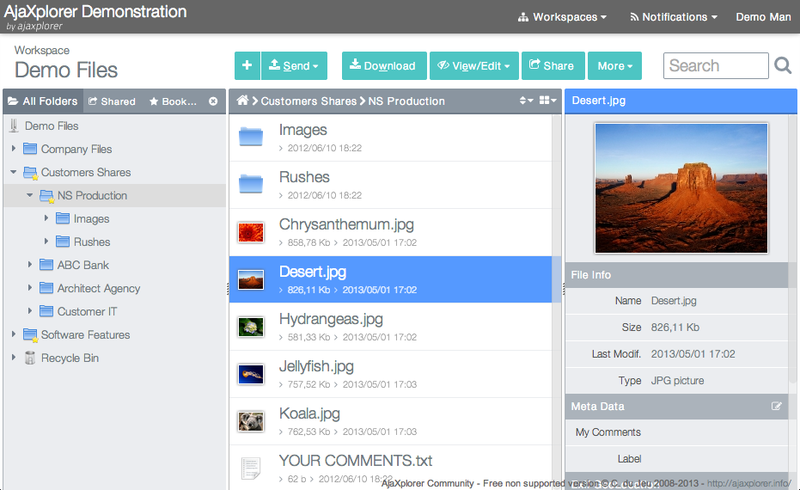 It integrates PNG watermark support as well as HTML5 drag and drop features. Multiple files can be uploaded and accessed with any advanced mobile, desktop or laptop. It is a web file sharing system that is run by the FTP server where you can perform a host of functions related to the file management system and share it with your team or community. You can upload and download files, cut , copy, chmod, rename and even have a view of your directory at the click of the button. It is an open source file management system that puts FTP file sharing right in your browser. It includes PHP and Ajax source code and is scripted for all types of programmers. Supported by Linux and Windows operating system, you can manage your important documents effectively, it also features multi-language support. It is a web based file manager written in PHP though which you can upload and download your files, copy and rename it with ease. Works on UNIX operating system. It does not require MySQL, but you can implement one if you require. It carries the GPL license and comprises of an advanced file finder. It is a totally free cold fusion based file exploration system that helps you to share your files and information through a read-only directory. It helps you to impart relevant information to your group or community without offering the right for snooping. It integrates an Ajax file loading system. A very impressive open source file management software that comes with a beautiful user interface and user management with access control. The tool provides easy ways to manage different file types including images, videos and documents.